Synopsis: sriman nArAyaNan, the consort of periya pirAtti srimahAlakshmi, offers a soul, a place in paramapadham. This HE does purely out of HIS grace. HE, who is characterized by the supremely intellectual, valorous and the ONE who is respite with kalyAna gunams, is someone who cannot be separated from any person in the whole universe. This is why all the acts HE does towards a person (soul) can only be an act of upliftment for the soul. Having said that there are other ways as prescribed by shAsthras that are actions performed by a person for his own betterment, that include the likes of karma yOgam, gyAna yOgam, bhakti yOgam etc. SAsthram try to test the knowledge of this soul by presenting before itself a multitude of paths to choose from. The souls (persons) who are cognizant of the fact that these aforementioned ways are not ways that can themselves fan fetch the grace of perumAL. Hence, these persons would never accept them as ways in the first place, rather accept only HIS feet as the sole refuge. In doing so, one may wonder if the act of surrender of a person to perumAL is a way to get HIS grace. The answer is that these persons while surrendering unto the lotus feet of sriman nArAyaNan, do so with the thought that their act of surrendering does not constitute as a way to reach HIM. Hence, the ultimate means to reach HIM is HIMSELF only and nothing else on one’s part. If one gets this thought, then even that thought is being fostered into the person’s mind by perumAL, says aruLALa perumAL emberumAnAr. vazhiyAvadhu onRu enRAl: This phrase describes the state of mind of a person who has understood the purport of shAsthrA’s conclusion. This is nothing but realizing the futility of other established means that includes karma yOgam, gyAna yOgam, bhakthi yOgam etc., in independently granting the lotus feet of sriman nArAyaNan. Except for the total surrender approach, also known as SaraNAgathi, the other means need the support of perumAL to fructify. Hence they do not possess the power to take a person to the lotus feet of perumAL, without the help of perumAL. Hence a wise person would never follow these means but would follow the 4th way that is known as ‘prapaththi’ or SaraNAgathi approach, since it is directly connected to perumAL HIMSELF. maRRavai muRRum ozhiyA: After realizing the futility of other approaches except SaraNAgathi, one should abandom them without any trace. The word “maRRavai” collectively refers to karma yOgam, gyAna yOgam and bhakti yOgam. The word “muRRum” denotes completely to mean that these three approaches should be renounced without any iota of attachment to it. The word “ozhiyA” is a grammatical transformation of “ozhithu”, i.e., to abandon. 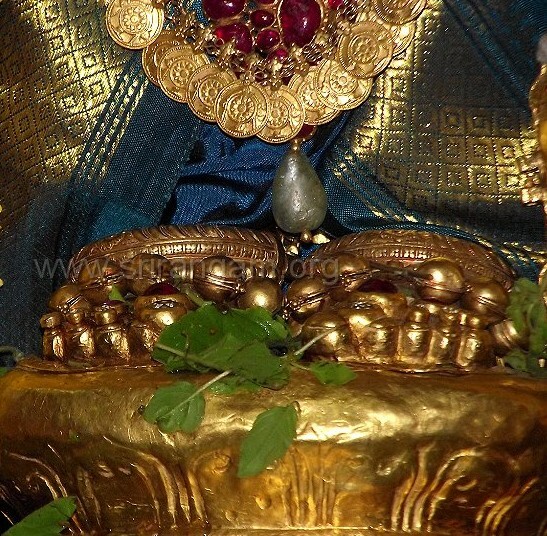 adhu onRu enRAl: “adhu” – prapathi or SaraNAgathi . This is also known as “bhagavAn”. The word “onRu” means exclusivity that is attached with bhagavAn and so would mean “bhagavAn only”. This exclusivity is known as “pirinilai EkAram” in thamizh grammar, that means “bhagavAn only and hence no one or nothing else apart from bhagavAn”. This wise person who surrenders unto the lotus feet of sriman nArAyaNan would never even imagine that the act of him performing surrender to perumAL is a way to reach perumAL. This is because the person knows that even his act is not a means to get perumAL. If a person has the thought that “HE is the means” and always thinks about this thought, then this very thought becomes an impediment to reach perumAL because indirectly the person thinks that this thought of his is actually going to take him to perumAL. This is not true. In other words, anything done by a person cannot be a means to take one to perumAL. It is HE HIMSELF that can be a means to take one to HIM. HE does not accept anything else apart from HIM. Hence, the word SaraNAgathi in interchangeable with perumAL. This is why HE is being referred as “adhu onRU”,that is typically used to denote a non-living thing. It is nothing but to illustrate that the path and perumAL are both the same and hence the usage of “adhu onRu” versus “avan onRu”. nammAzhvAr said “adhu idhu udhu edhu”. So the phrase “adhu onRu” would mean “perumAL only and nothing else”. Om enRu izhiyAdhE: This phrase is to be understood in conjunction with the previous one namely “adhu onRu enRAl”. aruLALa perumAL emberumAnAr continues that a person realizes that only SaraNAgathi path, which is none other than sriman nArAyaNan can be the sole protector. Hence, this person surrenders to HIM with the thought that this particular act of him, namely total surrender, will take him to HIS lotus feet. In other words this person treats his performance of total surrender to HIM as means to reach HIM. SAsthram says that is also wrong and can be a bigger obstacle. The very word “total surrender” implies that one has to leave everything unto HIM, including the thought that he has surrendered to HIM. So the word “Om” in this phrase means that a person has accepted SaraNAgathi as the best path and the word “izhiyAdhE” connotes that the act of a person who does not perform SaraNAgathi with the thought that he has indeed performed it. iththalyAl yEdhumillai enRU irundadhu thAn: So this begs the questions as to what should a person think of while doing SaraNAgathi. The answer is that the person should not do anything and remain as such with the thought that there is nothing that one can do in order to get HIS grace. The person should think about this vacuum that exists when it comes to the actions that one can take to reach HIM. aththalayAl vandha aruL: aruLALa perumAL emberumAnAr finally says that if a person gets the aforementioned thought, then even that thought is a result of perumAL’s divine grace and nothing else. In SAsthram, it is mentioned that the only way to get liberated and reach the lotus feet of sriman nArAyaNan is “total surrender”. When one is aware of this highest meaning, he should immediately renounce all other means like karma yOgam, gyana yOgam and bhakthi yOgam. Thus, this would mean that the way to reach HIM is “SaraNAgathi” (total surrender). This implies that a person’s act of doing SaraNAgathi can be a way to reach HIM. This question is burned without any trace in our sampradhAyam and the point that HE only is the means and nothing can ever be and will be. When SAsthram says, “only sriman nArAyaNan’s grace is the means”, the word “only” removes any question that may arise in accepting other yOgams as means. This “only” is a special kind of exclusivity that is known as “pirinilai EkAram”. This EkAram not only confirms the fact that other yOgams cannot be a means, it also confirms that only sriman nArAyaNan HIMSELF can be the only means and nothing and one else. So, if sriman nArAyaNan graces a person, HE does not need anything nor expects anything from him. HE graces out of sheer compassion. This can be seen in the pAsuram “veRidhE aruL seyvar”. Hence, sriman nArAyaNan, blesses and graces a person out of HIS volition and thus there is not even an iota of activity required on a person’s part. If a person is able to understand this point, then there is an implied fact that this person did not do anything on his part to understand this phenomenon. Rather even this ability to understand this and remain idle and do nothing about it, this thought is also given to a person by sriman nArAyaNan. A question may arise here as to is it true that even to do nothing , does one require the grace of sriman nArAyaNan. The answer is “definitely yes”. To do nothing is a great challenge. It is very difficult to remain without doing anything. So, there is definitely nothing on a person’s part that is required to earn HIS grace. This point has been talked in detail by many AzhvArs. thoNdaradipodi AzhvAr says “vAzhum sOmbar”. periyAzhvAr says “ninarulE purindhirundhEn”. “en uNarvin ullE iruthinEn” says nammAzhvAr. “un manathinAl yen ninaindhu irundhAi” says thirumangai AzhvAr. “nirandharam ninaipadhAga nI ninaika vendumE” says thirumazhisaipirAn. “siru mAnidavar nAm seyvadhen” says AndAL. thirukaNNamangai AndAn lived by this principle. This can be seen in mumukshupadi chUrNikai (230) that says “avanai ivan paRRum paRRu ahankAra garbham. Avadhyakaram. Avanudaya svIkAramE rakshakam”. An example is being talked about at this juncture. In srirAmAyaNam, sIta pirAtti did not follow any path to be united with sri rAmA. However, it was sri rAmA who did a lot of things including the likes of breaking the bow etc., It is sri rAmA who went towards the place where sIthA pirAtti was. The aforementioned concepts would be clear upon examining these incidents. This is the greatness of sage vAlmIki. Thus, it can be seen that the concept of total surrender is a lifeless entity just like any non-living thing. It is sriman nArAyaNan’s grace that one gets this thought. In thiruvAimozhi padhigam 6.10 (ulagamunda peruvAyA), we can look at a story that is being dealt in eedu vyakhyANam for “AvAvennum” pAsuram. nampiLLai asked nanjIyar, “svAmi, people say that there is something called the 5th means to reach perumAL”? Is it really true that there exists a 5th path? nanjIyar replied, “Adiyen does not know about it. HE, who stands as the fourth path is the final path. There is nothing more than HIM”. In arumpadham it is said “this should be carefully observed as something discussed in context of specifically establishing bhagavAn as the only path”.